Home Unlabelled DO YOU KNOW WHAT THE HALF MOON SHAPE ON YOUR NAILS MEANS? The white, crescent-shaped area at the bottom of our fingernails is an important and very sensitive area, so, we should always be careful not to cause any serious damage to it. Known as Lunula, which means small moon in Latin, this visible part of the nail’s root, if damaged, can permanently deform the whole nail. Nevertheless, if the rest of the nail gets damaged and falls off or if it’s surgically removed, the Lunula will remain in its place. however, not everyone has visible Lunulae. 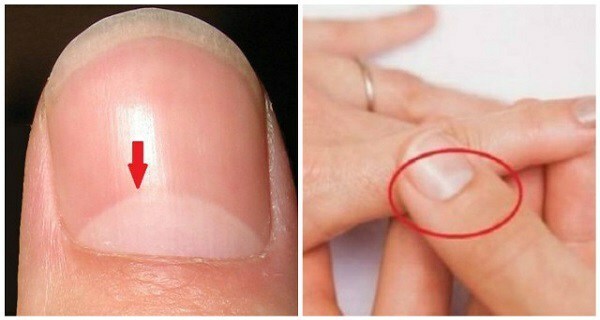 In some people, the thickened skin layer which surrounds the fingernails and toenails can cover the Lunula partially or completely. According to alternative medicine, the Lunula can reveal crucial information about one’s overall wellbeing. Hence, Chinese medicine holds that when a person lacks a Lunula, they might be suffering from anemia or malnutrition, whereas a bluish or pale Lunula is a possible indicator of diabetes. Furthermore, if the Lunula has reddish smudges, she/he might be suffering from heart problems.